Mohammadi, R., Isazadeh, M. (2019). Hydrothermal and sol-gel low-temperature synthesis of tin, silver co-doped TiO2 nanoparticles with enhanced photocatalytic efficiency: artificial neural network modelling. Asian Journal of Green Chemistry, (), -. Robab Mohammadi; Mohammad Isazadeh. "Hydrothermal and sol-gel low-temperature synthesis of tin, silver co-doped TiO2 nanoparticles with enhanced photocatalytic efficiency: artificial neural network modelling". 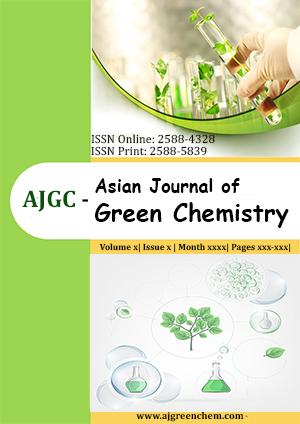 Asian Journal of Green Chemistry, , , 2019, -. Mohammadi, R., Isazadeh, M. (2019). 'Hydrothermal and sol-gel low-temperature synthesis of tin, silver co-doped TiO2 nanoparticles with enhanced photocatalytic efficiency: artificial neural network modelling', Asian Journal of Green Chemistry, (), pp. -. Mohammadi, R., Isazadeh, M. Hydrothermal and sol-gel low-temperature synthesis of tin, silver co-doped TiO2 nanoparticles with enhanced photocatalytic efficiency: artificial neural network modelling. Asian Journal of Green Chemistry, 2019; (): -. Pure anatase TiO2 nanoparticles with various Ag and Sn contents were synthesized by hydrothermal and sol-gel low-temperature methods. Structural and morphological characterizations of synthesized nanoparticles were performed by X-ray diffraction (XRD), transmission electron microscopy (TEM), scanning electron microscopy (SEM), energy dispersive X-ray spectroscopy (EDX), and N2 adsorption/desorption isotherm and brunauer-emmett-teller (BET) techniques. The effect of synthesis procedure on the crystalline structure, crystal size, surface area, pore size distribution and photocatalytic activity of synthesized samples were studied. The photocatalytic activity was tested vs. degradation of methylene blue (MB) under black light radiation. Ag/Sn-TiO2 nanoparticles synthesized by hydrothermal method showed higher photoactivity during the degradation of MB under black light irradiation because of being enhanced in the specific surface area, total pore volume, and its reduction in the crystallite size. An artificial neural network (ANN) comprising four input variables (mol% of dopant ions, photocatalyst dosage, initial dye concentration, and pH of the solution), eight neurons and an output variable (degradation efficiency %) was optimized, tested and validated for MB degradation by Ag/Sn-TiO2 nanoparticles synthesized via hydrothermal method. The results showed that the predicted data from the designed ANN model are in good agreement with the experimental data with a correlation coefficient (R2) of 0.979. A 98.9% photodegradation efficiency of MB was achieved by utilizing 0.07 mol% Ag and 0.03 mol% Sn co-doped TiO2 at pH = 12.